Champion Levels are awarded for points earned through contributions to the community. These points are awarded every time you post a new topic, comment on an existing post, or rate content. A member’s Champion Level enables other community members to trust content provided by top contributors, who often provide some of the highest value within their respective communities. The Champion Level is displayed next to a member’s name throughout the community as well as on the member profile page. 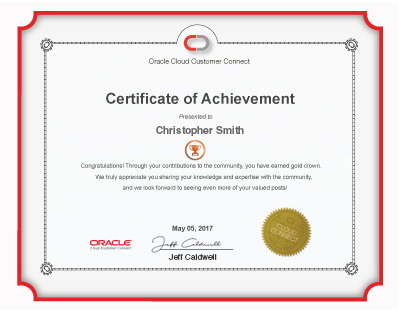 As members earn more points and reach the next Champion Level, they will receive a certificate via email with the option of adding the certificate to their LinkedIn profile. Certificates are sent on a monthly basis to members who have achieved a new champion status in the previous month. In addition to Champion Levels and Certificates, top contributing Service and Field Service members are eligible for All-Star status. Community All-Stars are selected annually, and recognized by this symbol displayed next to their name. Check in with our 2018 Community All-Stars here.